The new, spacious press box is set to open this August. 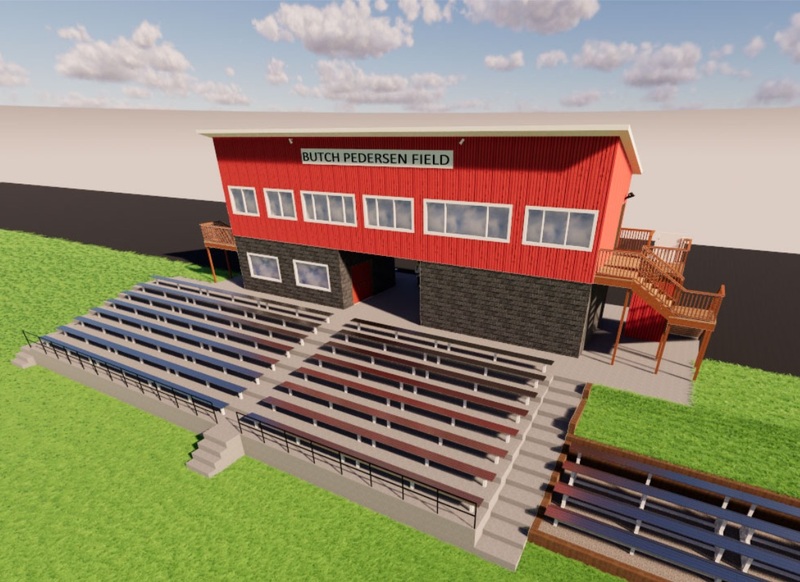 After a few months of extensive research, planning, and development, the new press box for Butch Pedersen Field at the Little Rose Bowl has completed the planing and bidding phase as the school board has approved a bid. The project was awarded to the Watts Group out of Coralville. The new press box, decorated with a new, permanent "Butch Pedersen Field" sign, will stand at two stories tall and will measure in at 63 feet long and 16 feet deep, providing a much-needed increase in space over the previous press box, which stood at the Little Rose Bowl for 30 years. The first floor will feature new concessions, offering a much larger space for workers and new opportunities for food preparation and efficiency. The first floor also features men's and women's restrooms, each containing three stalls/urinals and two sinks. In between the concessions and restrooms is the famous breezeway that fans can enter the stands from. The breezeway will feature a "brick wall of fame" to recognize donations and support for the new press box. The school district is also discussing the idea of allowing fans to purchase bricks of their own to show their support. The second floor features a total of six rooms, five of which will house press box personnel, announcers, scoreboard operators, the BearCast crew, West Branch coaches, opponent coaches, and media. The sixth room will function as a guest suite. Access to the suite will be auctioned off during the football season by the school as a fundraiser and will allow fans to enjoy a unique view for games. More information regarding the Guest Suite will be made available this coming Summer. Access to the second floor comes via stairs at both the north and south ends of the press box. The north end will contain a chair lift so disabled persons or those with heavy equipment can easily and safely access the second floor. Brian Boelk from Axiom Consultants, who the school has worked with during the planning phase, said in an email to WestBranchFootball.com that he anticipates construction starting late winter or early spring, with a completion date of August 1st, 2019. The press box project wouldn't be possible without all of the generous support and donations from members and businesses in and around the West Branch community. We are excited for the build process to start and to enjoy the new press box this coming fall.